BERKELEY – Negotiations to resolve the Sino-American trade conflict have so far centered on soybeans, natural gas, and an assortment of commodities and manufactured goods. 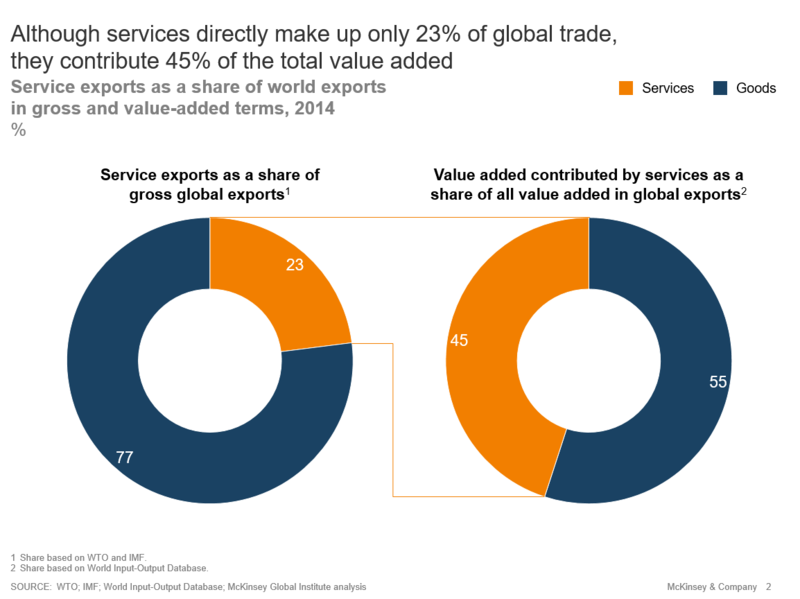 Yet, an increasingly important component of US and global trade is scarcely mentioned: services. Though the US runs a persistently large trade deficit in goods, it maintains sizeable bilateral services surpluses with many of its leading trade partners, including China. In real (inflation-adjusted) terms, the overall US services surplus increased by 145% between 2000 and 2016, and services now account for around 70% of US GDP and 71% of US employment, far exceeding the share of employment in manufactured goods. 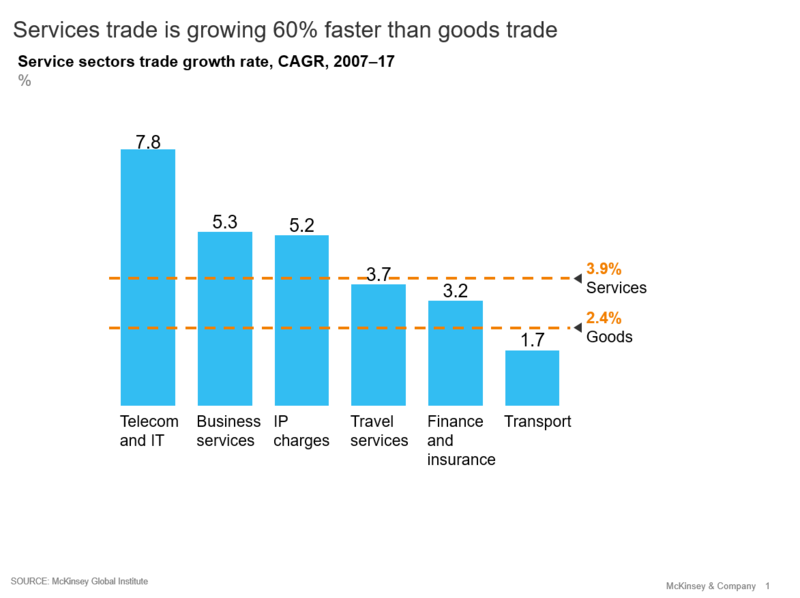 Similarly, at the global level, trade in services has grown 60% faster than trade in goods over the last decade; and some types of trade in services (telecom and information technology services, business-to-business services, and intellectual property charges) have outpaced growth in goods trade by a factor of two or three. To be sure, official statistics put the total value of goods traded in 2017 at $17.3 trillion, compared to just $5.1 trillion for services. But as a new McKinsey Global Institute report shows, these data significantly underestimate the role of services in tying the global economy together. For starters, services such as research and development, design, personalized marketing, and distribution account for about one-third of the value of traded manufactured goods. For example, when a cancer drug is sold internationally, that transaction is booked as trade in manufactured goods. Yet, to patients using the drug, the real value is not in the manufacturing process, but in the years of R&D that led to the drug’s discovery and development. By standard measures, direct trade in services as a share of gross trade flows has held steady at around 23% since 1990. But according to measures that account for the rising value of services in the production of goods, trade in services accounts for about 45% of value-added in global trade. Second, unless they are captured as intellectual-property charges, intangible assets that multinational companies send to their worldwide affiliates often go unpriced and untracked in global trade measures. Yet intangible assets are an increasingly significant determinant of corporate performance and value. Indeed, corporate investment in intangible assets such as R&D and brands has increased dramatically, with the stock of intangibles relative to revenues growing from 5% to 13% between 2000 and 2017. The hundreds of millions of dollars that corporations spend on brands, software, design, and operational systems in their headquarters confer a competitive advantage on their operations around the world, and thus represent significant value. Today, the main sectors generating cross-border flows of intangibles are technology (about $230 billion annually), health care and pharmaceuticals (approximately $160 billion), and consumer goods (about $110 billion). But, again, in the absence of royalty charges and franchise agreements, the value of such cross-border flows is not captured in official measures of trade. Finally, such indicators do not track cross-border flows of free digital services such as email, real-time mapping, video conferencing, music streaming, and social media. Yet every day, people around the world can and do access any one of Wikipedia’s 40 million articles in roughly 300 languages, or YouTube’s billions of hours of free video content. Free digital services have always posed a measurement problem for economists, but the challenge has become particularly vexing in the context of trade. Altogether, the MGI study estimates the annual value of these three inadequately measured channels of the services trade to be $8.3 trillion: $4 trillion of services trade that is not counted at all in official trade statistics, and $4.3 trillion of services trade that is currently counted as goods trade. By this estimate, trade in services is actually slightly larger, in value-added terms, than trade in goods. Viewed from this perspective, the focus of negotiations about bilateral trade balances should shift substantially, particularly in the United States, which generates almost one-third of the annual value of intangibles crossing borders, and is home to tech giants that have amassed huge global user bases. Besides, even by traditional measures, advanced economies collectively run a trade surplus in services of almost $480 billion, which is twice as high as a decade ago. The countries with the largest surpluses – including the US, the United Kingdom, France, and Sweden – are in a strong competitive position to capitalize on current trends. Some developing countries may also stand to benefit from the growing trade in services. The Philippines, India, Morocco, and Costa Rica, for example, have all become major global providers of back-office and IT services. But their future competitive advantage in the provision of such services will depend partly on whether automation technologies erode the market for customer-service calls, data entry, remote administrative work, and similar cross-border labor-intensive services. To avoid technological displacement of the services trade based on labor-cost advantages, emerging-market economies will need to move into higher-value offerings like software and web development, graphic design, and advanced data analysis. In the meantime, the next wave of technological innovation will greatly expand the range of cross-border services on offer. Ultra-fast 5G networks, virtual reality, and advanced robotics will allow for virtual classrooms and remote services ranging from surgery to the maintenance of industrial equipment. Many producers of physical goods are already offering related in-house services, such as after-sales maintenance and pay-by-usage plans, to their global customers, while software companies are shifting from packaging their wares to offering them via the cloud. In today’s world, cross-border flows of services are already too big to ignore – and they are growing rapidly. It is time for trade measurements and negotiations to catch up. As governments assess their external balances and competitive positions, hammer out trade deals, and set national policy agendas, they need to look beyond manufacturing and agriculture. Services – which are likely to become even more important sources of employment and trade as automation continues to substitute for human workers in the production of goods – also matter.